Roosevelt Mills maintained a sales office in New York City. Sales were made to major retail chains, such as J.C. Penney, Montgomery Ward, and others. A separate corporate entity, Mill Outlet Stores using the Roosevelt Mills' name, was established to sell the company's products in Connecticut and Massachusetts. In 1986, Roosevelt Mills was sold to a new owner. The new owner, an absentee, did not have the same commitment to the community and the employees as the founders. 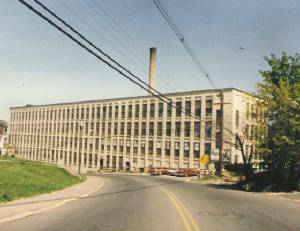 Within two years, the mill was closed. Now vacant, it awaits renovation. Roosevelt Mills was a major employer in Rockville. Its products were sold across the nation. The company was noted in the knitwear industry for being innovative and progressive. Founded in 1941 with minimal capitalization, the company succeeded in expanding and becoming an industry leader. We are currently working on a history of Roosevelt Mills. If you are a former employee or the descendant of a former employee, we would like to hear from you. We are seeking reminiscences, examples of company product, and photographs.